We recently met a group of surfers in Honolulu, Hawaii just outside of Waikiki. Walking along Diamond Head Road and the Pacific Ocean, we headed from Waikiki Beach toward Fort Ruger and Kapiolani Community College. This group looked like they were having so much fun, we stopped to talk with them. After a morning of surfing, they met for a potluck at the beachfront park. They had quite a spread including homemade pumpkin bread. This group surfs together in this spot and gathers for informal parties regularly. Any excuse for a potluck is welcome. Recently celebrated were Christmas, Thanksgiving and their patriarch Gilbert’s birthday. We watched this garden over the past six years and it is a highlight of our early morning walks. It is a favorite place to stop, admire the view, talk to the gardening crew and others gathered at this local hangout. This is their fourth annual tree trimming party. There are not many evergreens growing along the tropical Pacific coastline and the local preference against tree removal has forced the community to improvise using a cactus tree. The group set the food selections on the low wall. Next, they assembled several boxes housing an eclectic collection of ornaments amassed through the past four years. 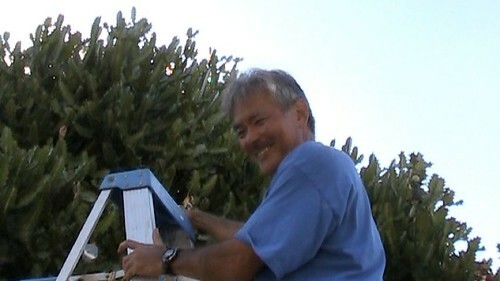 One of the bravest souls, Doug, teetered on the tall step ladder as they decorated the 20 foot cactus tree and shared memories sparked by the decorations. Kevin Simon is holding the ladder steady. Thanks to Jan, here are some of the cast of the video and behind the scenes details. Gilbert is the patriarch of the garden, the older Asian man. Without him, the garden would be non-existent, as he has nurtured it from dirt for the past 10+ years with plantings from his own residence. We are just his “helpers.” Soyu Kawamoto is the man who said his favorite ornament was the burlap “rat.” He is an awesome surfer! Steve Casar was the elf that put up the “McCafe'” ornament. Other people that I could see in the background are Meiko, Fe, Ihan and her daughter Jade, and Aussie Pete (we have approximately 6 “Petes:” Aussie Pete, Painter Pete, Dr. Pete, El Camino Pete and a just-plain Peter). There’s also Buddha Pete, a religion professor at the University of Hawaii. A somewhat somber person when I first met him, I now call him “Sunshine” when greeting him out in the water…he likes that, it makes him smile. If you are near Diamond Head Road and you spot one of these beachfront potlucks, pull over, park your car and share your malasadas and a few laughs with the crew. Mele Kalikimaka from the crew of Where Are You Today?